Is it Safe to Walk your Dog on the Beach? In May of 2007, Wally, the 12 year-old Basenji pictured on the right, ate dead sand crabs on Del Monte Beach and almost died from what is believed to be acute domoic acid toxicity. Wally suffered from symptoms associated with vertigo (loss of equilibrium, scratching the ears, vomiting, lethargy), seizures and partial paralysis in his back leg. Although he survived, Wally has never fully recovered from the incident and still experiences minor tremors. Initially trying to diagnose Wally’s ailment was difficult. Local veterinarians did not think any of Wally’s problems were linked to a trip to the beach even though Deidre Sullivan, the dog’s owner, mentioned that on one recent trip there were an unusual number of dead sand crabs on the beach and Wally was eating them. Deidre left the beach once she noticed Wally eating the crabs and Wally threw up on the way home in the car (very unusual for him). The veterinarians proceeded with a battery of tests to no avail. Determined to save Wally’s life, Sullivan, Director for the Marine Advanced Technology Education Center at Monterey Peninsula College, did some online research, contacted the Marine Mammal Center (MMC) and the School of Veterinary Medicine at U.C. Davis. Sullivan also had a colleague, Colette Williams, from the School of Veterinary Medicine at U.C. Davis evaluate Wally. Although domoic acid passes through the system quickly and cannot be detected a few weeks after the incident, Williams felt that Wally’s symptoms and tremors may be associated with domoic acid toxicity. According to MMC, an organization that has been researching toxins in marine animals for over 30 years, domoic acid is a biotoxin produced by a diatom (a type of phytoplankton or unicellular algae). These diatoms can produce harmful algal blooms (HABs) and are believed to have caused the death of a large numbers of seabirds and marine mammals on the California Coast over the years. 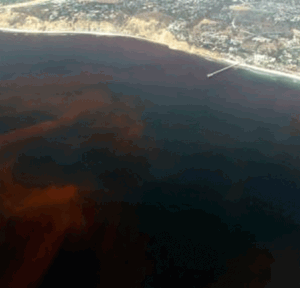 HABs, sometimes referred to as ‘ride tides’ because of the deep red color that some blooms produce, are outbreaks of toxic algae that poison marine life and contaminate seafood. Some HABs produce a potent neurotoxin known as domoic acid that causes tissue degeneration in the brain, posing a serious threat to any species that eat the algae or any organism that has been eating organisms that eat the algae (the sand crabs in this case). Eating seafood (such as mussels) that has consumed diatoms with domoic acid can cause the potentially fatal amnesic shellfish poisoning in humans. When traditional veterinary tests were providing no answers, Sullivan started searching the connection between sand crabs and HABs. 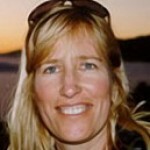 Thanks to the Internet, she found a scientific publication that linked sand crabs to domoic acid toxicity. 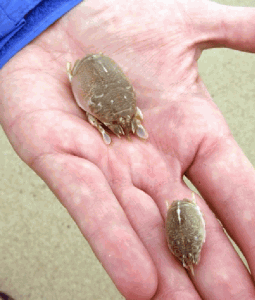 The same species of sand crabs Wally ate shortly before getting sick (Emerita analoga pictured on the right) have been identified as a possible new indicator species for domoic acid toxicity in California coastal waters (Ferdin et al, 2002). The sand crabs are useful species for measuring levels of domoic acid because they eat diatoms. Sullivan also discovered a severe HAB outbreak had taken place during that time. The Center for Sponsored Coastal Ocean Research (CSCOR) reported that a “massive HAB along the California coast escalated in April 2007, resulting in record toxin levels and hundreds of seabird and marine mammal deaths.” The photo on the right showing a red tide in the Monterey Bay was taken in the Winter of 2007 (Kudela). The Department of Health issued a seafood harvesting quarantine, but the connection between HABs and dog illnesses has not been widely documented and pet owners who frequent the beach without a problem would not know or expect that one day everything could be different. Although beaches have occasionally been closed immediately following HABs, dead animals that end up on the beach several days after the outbreak can still pose a threat, as they did to Wally. 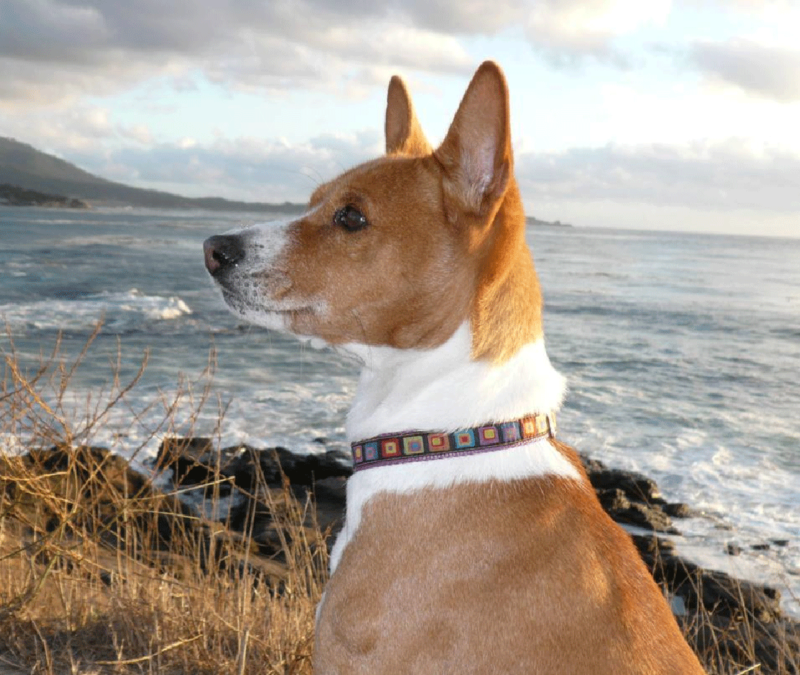 Sullivan believes domoic acid toxicity in dogs may be far more common than people realize. Although the National Oceanographic and Atmospheric Administration (NOAA) has a program in place to forecast HABs, measures for compiling and disseminating the data to fully understand algal blooms and inform the public require further development. While coastal upwelling brings rich nutrients to the surface that result in the growth of algae, recent studies conducted by Dr. Raphael Kudela from U. C. Santa Cruz have determined the spread of domoic acid producing HABs is partly anthropogenic due to urea pollution, a human made chemical used in home garden fertilizers, manufacturing processes, and wastewater treatment. After it rains, urea contaminated runoff flows into coastal waters and stimulates the toxic algal blooms (Coombs 2009). As more frequent and intense events occur due to human induced pollution and climatic disruption, health hazards may increase along with more incidents of poisonings. Better communication among agencies and organizations and greater public awareness of the potential dangers of HABs, as well as early warning systems, need to take place. One key to achieving this goal is to support increased funding for ocean observing systems that will contribute information to early warning systems. The Centers for Ocean Sciences Education Excellence (COSEE) is one of the many organizations that brings ocean scientists, educators, and the general public together to understand the role that the oceans play in our daily lives including our health and that of our pets. COSEE NOW (Network Ocean World), one of the ten COSEE centers, is working specifically to raise the awareness of ocean observing systems. Centers for Ocean Science Education Excellence (COSEE). 2009. Centers for Ocean Science Education Excellence Networked Ocean World (COSEE NOW). 2009. Goldstein T, Mazet JA, Zabka TS, Langlois G, Colegrove KM, Silver M, Bargu S, Van Dolah F, Leighfield T, Conrad PA, Barakos J, Williams DC, Dennison S, Haulena M, Gulland FM. Novel symptomatology and changing epidemiology of domoic acid toxicosis in California sea lions (Zalophus californianus): an increasing risk to marine mammal health. Proc Biol Sci. 2008 Feb 7;275(1632):267-76. Sullivan, Deidre. Personal Interview. February 2009. One Response to Is it Safe to Walk your Dog on the Beach?